Boasting a sporty look and intricate engineering, the Tag Heuer CAV5115.BA0902 Grand Carrera Automatic Chronograph Black Dial Watch is an impressive timepiece that suffers from a bit of over-design. Everyone loves a beautiful watch with lots of toys, but there are so many features clogging this Tag Heuer’s face that it becomes difficult to tell one from the other. First, it must be said that with an exhibition caseback, three subdials and a burnished stainless steel bezel, this is a beautiful and impressive watch. A seconds rotating scale and unique cote de geneve bar are uniquely decorative features that might appeal to a man with an exuberant fashion sense. Once all of these gorgeous features, however, are packed onto a 43 millimeter black dial and joined by luminous accents, stainless steel indexes, a calendar function and a red-tipped seconds hand, things begin to get crowded. Though the CAV5115.BA0902 boasts accuracy to 1/10th of a second, it looks like the kind of watch that a nutty professor might own. There are lots of great ideas here, and some truly inspired design, but when taken altogether the effect is somewhat cluttered. Specific concerns that exemplify how design can negatively affect function include the difficulty one might have in reading the rotating seconds scale. It looks fantastic, of course, but unless the stopwatch function is running, you might have quite a lot of trouble reading the dial. And then there’s the question of usefulness: though a watch this luxurious should (and in this case, does) keep perfect time, how often do you need to know time to a tenth of second? Rarely, I bet, or never. 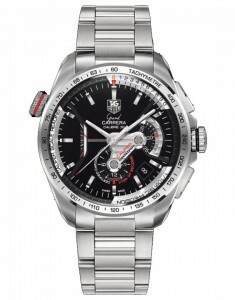 For customer interested in a Tag Heuer watch with a more timeless style, I suggest the Men’s CJF211A.BA0594 Chronograph Automatic Day-Date Watch, which boasts similar chronograph features and a much more subtle, understated dial. There are likely many consumers who will respond to the CAV5115.BA0902’s sporty, unique style. And the Swiss movement, accurate almost beyond belief, is certainly impressive. But the Grand Carrera Automatic Chronograph Black Dial Watch does not, for me, make the transition from day to night – I cannot imagine it paired with a tuxedo or business suit. For that reason, I prefer to invest in another timepiece from the Tag Heuer line – one with a slightly more refined palette.